Today people have love-hate relationships with books. Therefore, many blame the all-presence of digital media. Indeed, we’re too busy on Snapchat, Facebook, Instagram, or perhaps internet skimming has made us incapable of reading. Therefore, we have forgotten that every great book is a portal — to adventure, to knowledge, or to new perspectives. As well as, ”the more that you read, the more things you will know. 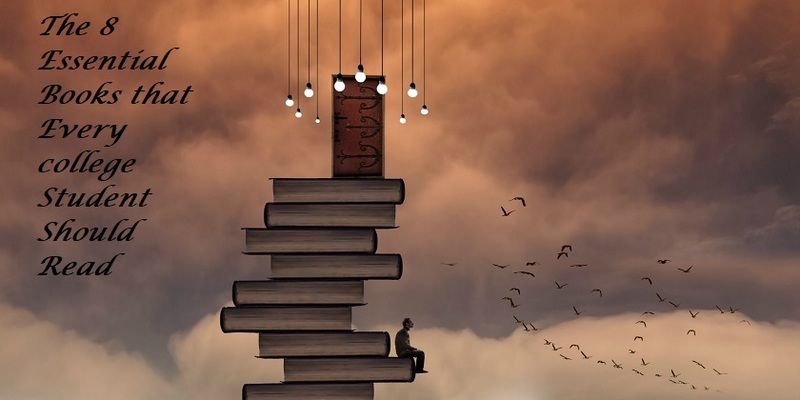 The more that you learn, the more places you’ll go.” And “A reader lives a thousand lives before he dies. The man who never reads lives only one.” Therefore, I have brought The 8 Essential Books that Every College Student Should Read! Since a healthy body holds a healthy mind, exercise is the key to it. It is the most powerful tool available to optimize brain function. Everybody knows that exercise helps to create a fit body, however, many forget that the brain is a part of the body. Yet, SPARK by John J. Ratey is a captivating journey through the mind-body connection, illustrating that exercise is truly our best defence against everything including depression, ADD, addiction, menopause, and Alzheimer’s. Moreover, it is steeped with amazing case studies such as the revolutionary fitness program in Naperville, Illinois. Also, the author explains that exercise boosts levels of serotonin and norepinephrine, and causes the release of a newly discovered substance in the brain called BDNGF. So, the author does an awesome job explaining all about exercise and brain strategies. Therefore, it is a must-read for the students. Whether you are a student struggling in math and science or somebody who needs to excel in these subjects for some specific career purpose, A Mind of Numbers by Barbara Oakley offers the tool to help you restructure your study strategy. After facing many hardships throughout her career, Oakley returned to school with a newfound determination to re-tool her brain to master the very subjects that had given her so much trouble throughout her entire life. In A Mind of Numbers, the author reveals us all the secret to effectively learning math and science. Notably, most people think that they are often a few ways of excelling and doing math and science, contrary to their beliefs, math and science only require your creative, analytical, and logical thinking. Thus, A Mind for Numbers shows us that we all have what it takes to excel in math. Besides, learning is not as painful as some might think! Deep work is the ability to focus without distraction on a demanding task and a skill to master complicated information and produce better results in less time. Deep Work by Cal Newport is a guide on how to have focused success in a distracted world, master your work and produce better results efficiently. Besides, make some drastic changes in your schedule and not to lose yourself in shallow work. Living and working in the twenty-first century, we are well aware of the abundance of distractions. Therefore, Deep Work is a fascinating read about the benefits and practical steps you can take to do deep work, increase productivity and get the results you desire. The Power of Habit is an award-winning New York Times masterpiece of business reporter Charles Duhigg. In which he takes us to the thrilling edge of scientific discoveries that explain why habits exist and how they can be changed. Besides, he brings readers’ life a whole new understanding of human nature and its potential for transformation. The reason it’s such a good book is that it uses research to explain how habits are formed and changed. Indeed, it’s best to forget about big changes, start with small ones. Every habit will trigger a domino effect and you will be amazed. And there might be people fed their lives due to workload or depression and then in what appeared as if almost overnight, changed themselves in a short period of time. How did they do that? They formed new habits and changed old ones, that’s how. Everyone has habits; some of these habits are good habits, some are bad habits while some habits have little to no impact on your daily life. However, for most people, good habits need to be practised and sharpened. As well as, they must be learned and often take more conscious effort than bad habits do. Therefore, 7 Habits of Highly Effective People by Stephen R. Covey focuses not on eliminating bad habits but on building up good ones. Moreover, it is a go-to resource for anyone who wants to improve themselves as it can help to make a person more effective personally, professionally, and in family life. As well as, the author shows how to build the healthy relationships that are key to an effective life. Besides, he mentions that we choose how to respond to what life throws at us. So, we should take the responsibilities for our actions. From an early age, we learn that Restlessness, distraction, and ignorance are the enemies of success. We’re told that learning is all self-discipline, that we must confine ourselves to designated study areas, turn off the music, and maintain a strict ritual if we want to ace that test, memorize that presentation, or nail that piano recital. But what if they are nothing but stupid myths! However, in How We Learn, the Author Benedict Carey shares his decades of education research and landmark studies to uncover the truth about how our brains absorb and retain information. Accordingly, from the moment we are born, we are all learning quickly, efficiently, and automatically; but after while we start ignoring the valuable, naturally enjoyable learning tools like forgetting, sleeping, and daydreaming. Therefore, he comprehensively explains and reminds us all the tools through his book- How We Learn. The author Denial Coyle explores that where talent comes from, how it grows—and how we can make ourselves smarter. Besides, to be creative, you need to slow down, to let your mind wander – because under pressure the brain uses those high bandwidth pathways and you do the same old thing. So, Coyle’s ‘talent code’ is also about how to shut down creativity. Because to be creative, you need to make new links, new connections, travel down little-used routes. So, they were the 8 Essential Books that Every College Student Should Read! I hoped it helped you choose your next read or your first read. Moreover, what other tools have you found useful? Please, share your views and recommendations in the comments section below.